On Saturday night I was totally convinced that Cherfy, Kenneth and I were going to watch Falstaff at Lincoln Centre. I got downstairs to meet them only to find Shuxiang, Mark and Adrian there as well. I thought we were all going for dinner together before the opera. Turns out I was only partially right - we were going to dinner, but there was no opera to go to. I had been completely and utterly duped. I was most impressed. I did not suspect a thing. This was a surprise early birthday dinner (because quite a few people would not be free next weekend, myself included, hopefully - I am on the waiting list for my church's fall retreat). Cherfy had gone to much trouble to deceive me about Falstaff and Kenneth had rounded up the others. They even gotten in touch with Cass, and Serene and Greg came all the way down to New York too! I called Janice at the very last minute and she braved the pouring rain to come uptown. I was very, very touched by it all. We went to Carmine's on West 90th Street, a big bustling Italian restaurant where all the food comes in jumbo family portions and everyone shares everything (think the Chinese version of Italian food). We had to wait almost 3 hours for a table - I kid you not. Very New York. On the weekends, all the good places to eat are just packed to the brim. Carmine's also refused to take reservations and big parties are always harder to seat. Most of the time was spent rather enjoyably in raucous conversation in the comfort of a nearby Starbucks. The wait was not in vain - the food was most excellent and the size of the portions bordering on obscene. We rounded off the meal with a yummy tiramisu cake and they insisted on singing Happy Birthday in Chinese, and then in Malay, because everyone else was singing it in English. I was deeply embarrassed but also greatly tickled, not knowing whether to laugh or to hide under the table. After dinner a few of us went on an impromptu road trip up to Princeton - Greg had driven up to New York and so we gave Serene a lift home after dropping Cass and Janice off downtown. The random road trip turned out to be much fun even though there was some initial protestation on Serene's part - she didn't want us to be driving around so late. But we didn't want her to be travelling on public transport so late all the way back to rural Princeton, and we really weren't taking no for an answer. The freeways were clear and Jersey city spread out before us in a sea of light. As we were approaching Princeton, we saw a deer dancing on the green. We got back to Manhattan around 4am. I crashed straight into bed, only to be woken by numerous phonecalls. We were brunching in Chinatown. We had yummy northern dim sum at Shanghai Cafe - that woke me right up. Cherfarn pointed out that my birthday had become an 15-day long fête - like Chinese New Year. I very much liked the sound of that. Just like all my other birthdays, I even have an exam very close to it - I have an oral French mid-term this Friday. All part of the celebrations of course. Janice and I were going to drop by her apartment but we took a wrong train and ended up in Brooklyn. It was a lovely accidental trip. 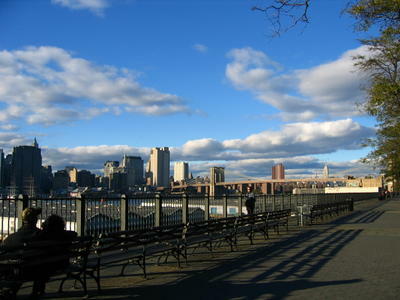 She suggested we go to the Brooklyn Heights Promenade and so go there we did. 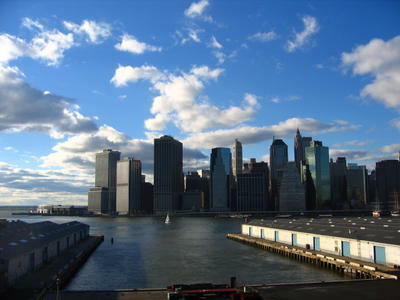 The views overlooking the East River and Manhattan were stunning. 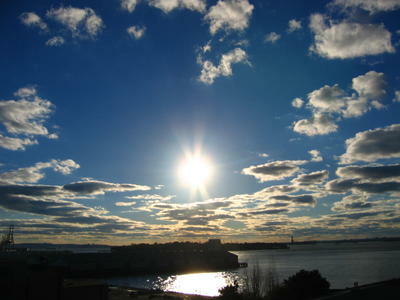 The weather was perfect - clear skies sprinkled with clouds, a crisp breeze and gentle sunshine. It was so beautiful, I was almost taken by surprise. This whole weekend in fact, has just been one beautiful surprise. Today we had our last seminar session with Professor G. A. Cohen - we had done this seminar series at double speed (two sessions a week) because he's only here for 7 weeks. He leaves for Oxford tomorrow. I attended Prof Cohen's lectures while I was in Oxford, so I was thrilled beyond words to find out that he would be visiting Columbia for 7 weeks this term. I somehow managed to get into his oversubscribed class, and I've really enjoyed these 7 weeks. I attended Prof Cohen's Plato lectures 3rd year in Oxford. This series of seminars that have just concluded were about the most recent debates in liberal political philosophy, centering mainly around justice and equality (Rawls, Dworkin and Cohen et al). While at Oxford, I dabbled in all the philosophy between Plato and contemporary liberalism, covering ethics and metaphysics in the process. But my favourite subject area of philosophy is still political philosophy. I suppose it's fitting that I got to take this seminar on contemporary political philosophy with Prof Cohen, because he is the one who gave me an introduction to the earliest important political philosophy that we know (we covered the Sophists as well). I love it because it speaks to our fundamental dissatisfaction with the way things are and our deep desire for the way things should be. All good political philosophy seeks change, from Plato to Rawls, Dworkin and Cohen. It is fuelled by discontent and a ceaseless searching for radical improvement. But you see, as much I love political philosophy, I do not think that it is the answer to our problems. And becoming better acquainted with it over the years has just made me more certain of my basic convictions. I have been mulling over the tension between secular philosophy and faith-based theology for a while now. One of the most fundamental clashes between Christianity and liberalism turns on the issue of religious conversion. Christians are called to proclaim the gospel in the hope that others will also believe and be "converted" (but of course the question of how we are to best proclaim the gospel is in no way straightforward). It was this Sunday at church that Tim Keller gave a most brilliant exposition of the conflict, and it's resolution. We underestimate how pervasive and deep rooted our white, Western Enlightenment, philosophically liberal assumptions are. When we insist that encouraging religious conversion is intolerant, we subscribe to a view of expressive individualism, which we hold and which we, by the same token, try our darndest to convert others to. To be converted by a non-innate, comprehensive view of reality is unavoidable. We are all converted. The question is - which view of reality do you subscribe to? Which view of reality are you converted by? As Charles Taylor (also of Oxford) wisely said, 'Liberalism is a fighting creed'. It is one truth-claim among many - just ask the Islamic fundamentalists. One question I used to frequently ask my trenchantly liberal friend was "If you are so liberal, why can't you accept a "conservative" point of view?" Political liberalism is hardly the benign, magnanimous, all-inclusive, endlessly tolerant and wonderfully cuddly philosophy that it is sometimes made out to be. It is one conditional truth-claim among many. It just so happens to be the dominant truth-claim in modern Western societies, which, of all the societies in the world today, have the most global economic and political clout. Christianity's view of things is a view of reality based on faith. The modern liberal view that says that, you mustn't convert people because all religions are subjectively valuable, and no one religion is more objectively more true than another, is similarly a view of reality based on faith. It also takes faith to not have faith. If it's narrow to say that one religion is the right one, then it is just as narrow to say that one view of religion (i.e. that they are all equal) is the right one. To say that you musn't convert people because all religions are subjectively valuable, and no one religion is more objectively more true than another, is a view that you are saying is the right one. And it's more right than the Christian one, or the Muslim one or the Jewish one etc. So when you say that you mustn't try to convert people to a non-innate, comprehensive view of reality, you are trying to do the very thing that you forbid. But when you say that anyone who is trying to convert someone else to their worldview is, on principle, intolerant, then you are being a hypocrite. Conversion to a non-innate, comprehensive view of reality that changes your whole life, and then seeking to convert other people, is unavoidable. However, this does mean that I am not entirely comfortable with the truth-claim that liberalism makes about the subjectivity of all religion. But as I said, my persuasions are essentially democratic. I believe that you have as much right to believe what you do, as I do. There is no point forcibly foisting views upon others - religious conversion needs to be genuine and personal, if not it's better not to be converted at all. God gave us all free will and I absolutely believe in our individual right to choose. But what we should all recognise is that we are all trying to convert each other to some extent; the Liberal, just as much as the Christian. Liberals are just as "evangelical" as Christians are, the only difference is that there are far more of them in positions of power. The question is, which truth claim leads to embrace of people who are different than you, and which truth claim leads you to scorn people who oppose you as fools? Which truth claim leads to genuine community? Which truth claim both humbles and affirms you, so that you are not afraid of people who disagree with you, nor can you despise them? This one. Jesus died for all of us. For you. And for me. If I build my name on being liberal, then I am going to despise conservatives. If I build my name on moral and traditional values, I am going to despise liberals. If I build my name on being hardworking, I am going to despise people who are lazy. But if I build my name on what Jesus Christ did for me, paying for my sins by dying on the cross, paying the price that I could never pay, dying in my place, so that I can have eternal life with God, now and forever more, how can I feel superior to anyone? The only way we have eternal love, the only way we have heaven, is not because we are better than anyone in any way whatsover, not because of anything that we have done, not because of anything that we can do, but because of everything that God has already done for us. And understanding this truly amazing grace both humbles and affirms you. I am more sinful than I ever before believed, but infinitely more loved than I ever dared hope. My identity is built on somebody who was excluded for me, who was cut off from the land of the living on my behalf, who loved his enemies even at the point of death, and that is going to turn me into someone who embraces. That is what should be the basis for the new human community that this world so desperately needs. I simply do not think that secular philosophy is capable of fundamentally altering our motivations and changing our hearts, as much as it strives to. Thinking of cleverer institutions does not fundamentally change the way we are, and intellectual theories about ethics and morality do not really have a widespread and deep enough grip on the human soul (see also The Revolution). But knowing God changes everything. This is the real change. At first I was uncertain about whether to go for the concert but in the end I was so very glad that I went. 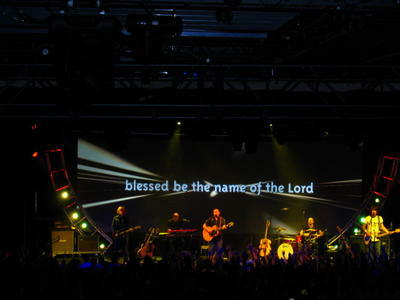 Chris Tomlin's music turned out to be much better than I expected (he sang lots of stuff from his new album, Arriving) and Matt Redman, whose music I've always liked (Blessed Be Your Name is one of my favourite songs, ever), got quite a bit of stage time too. In a way, the concert was like a big flashy church service, with really cool graphics and fantastic sound and lighting effects. But the best part was that the concert wasn't about any of that or either of them and their status as music stars. The words of the songs came up on screen and everyone sang along. We were all singing to an audience of one. I think it's so human to want to sing when you're happy. When your soul is full of joy, when your feet are full of dancing, and your heart is full of song. 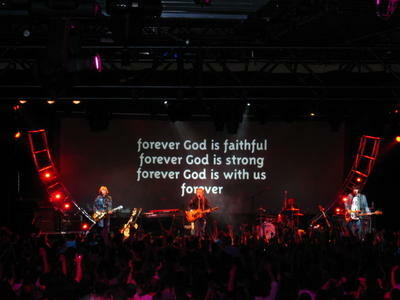 I sing because I'm happy, I sing because I'm free, His eye is on the sparrow, and He watches over me. And this is where words somewhat fail me. Cassandra's (Oct 3, 4) written a far better account. I highly reccommend it, and I agree with her wholeheartedly. I learnt more of what it was to love God with all your mind and all your heart. And I learnt more of what it meant to be loved.